The reason I haven’t posted many reviews lately is because there’s been almost nothing I’ve wanted to see. Even FOMO Syndrome won’t get me to STAR WARS. I’d rather claw myself into unconsciousness than watch THE REVENANT. And I would take no JOY sitting through David O. Russell’s latest bag of tics. (I’ll stick with Wes Anderson for whimsy.) Still, if there’s a new horror movie or non-romantic comedy, I’ll pretty much go. And since Will Ferrell and Mark Wahlberg have been in some really funny movies, alone and together, this sounded promising. But it’s godawful, with godawful timing (acting and editing) that leeches out what little steam there might have been in any given gag, gag after gag. Linda Cardellini (a B-list Janeane Garofolo, no, make that a C-list Leslie Mann) offers the men nothing to play off of. Still, they should have been able to generate a few laughs on their own. Instead, Wahlberg is dullsville and Ferrell seems barely interested. All of this at least applies to the first half hour; that’s how long I lasted. After more than 30 years of waiting, suffering through three prequels loaded with too many special effects and things we will never be able to unsee (I’m talking to you Jar Jar and Hayden! )…the darkness has finally been lifted and fans finally have the movie they’ve been waiting for. JJ Abrams takes over for an out of touch George Lucas and brings back everything we loved about the original trilogy. From the opening crawl we know and love to the closing credits, this movie does the unimaginable: reboots the franchise. Old characters we love. ..new characters we come to love…I felt like I was a kid again. The Force is strong…and back big time! Bravo! A mystery western that takes place after the civil war, this latest offering from QT is also one of his most enjoyable. Kurt Russell, Walton Goggins, Samuel L. Jackson, and others bring their A games and chew up the scenery…especially Russell who looks like he’s having more fun here than he has in years. A whodunnit and whydunnit that’s an entertaining mix of Reservoir Dogs and Clue…with a dash of Pulp Fiction…it works. The scope is smaller, the story simple, and the dialogue different than anything Tarantino’s done before. Bottom line? Loved Hateful. The title of course nods its Stetson toward THE MAGNIFICENT SEVEN, which, being a sweeping Western with an ensemble cast, it resembles. [Sidebar thought: the phrase “The 8th Film by Quentin Tarantino” works fine in marketing and promotion — but to place it at the top of the credits (instead of the standard “A Film by Quentin Tarantino”) raises the bar for Hollywood self-adulation.] Anyway, back in 1960 when MAGNIFICENT was released, the Production Code was dying, but there were still strictures on gunplay. That came to mind during perhaps the most extreme moment in EIGHT — a point-blank shotgun blast to the face. Pulp fiction, indeed. Tarantino used to shock us with the suddenness of violence and its scary ugliness. Michael Madsen in RESERVOIR DOGS, Christoph Waltz in INGLOURIUS BASTERDS. But with DJANGO UNCHAINED and now here (really, the two are companion pieces) the violence is more like ballet. The aforementioned blast to the face doesn’t have the oh-my-god-i-can’t-believe-that-just-happened!! feel of, say, the gun going off accidentally in the back of the car in PULP FICTION. Here, it’s walked up to slowly, making sure we know we’re going to see someone’s brains blown away. To me, not as effective. But three quarters of the movie is lead-up, and you’re hooked. Much of it plays out in two confined spaces — a stagecoach and then a general store where these blizzard-trapped hateful people are all understandably wary of one another. The screenplay is terrific; if your fear is that two hours of talk would be talky, forget it. The lines are great, and the dream of a cast delivers to a man — and woman: Jennifer Jason Leigh we hardly knew ya! As the handcuffed bounty bound for the noose, she acts like she deserves to hang, and you love her for it. Singling out two others: if “larger than life” means anything, it’s Kurt Russell. He’s the Jeff Bridges of his (and, well I guess Jeff’s) generation. Rules the screen. And Walton Goggins, mostly from tv, rocks his racist role. Goggins is also half the reason why the movie ends up (in a way) like DJANGO, with a faint dusting of civics by way of a lecture on race relations. A movie this dependent on close interactions in even closer spaces demands that the editor be credited: killer job, Fred Raskin. As for the 70mm, we get the expected gorgeous sweeping vistas when the movie is outdoors. But how amazing is DP Robert Richardson for also being able to fill up his giant screen with those two smallish spaces, the stagecoach and the general store, and still create the sense of claustrophobic dread that gives so much of this movie its spark. How to explain the event and misdeeds that led to the 2008 worldwide financial crises and the collapse of the housing market? It is a challenge to be sure, but one Adam McKay is up to in THE BIG SHORT. Based on Michael Lewis’ book, it details how a few smart guys saw the bubble (even though as one person says in the film, “a bubble is invisible”), bet against the American economy and made billions. THE BIG SHORT is funny, dramatic and will make you shake your head in wonder and disgust. Were the banks dumb, crooked, blind or a combination of all? That is something you’ll have to decide for yourself after watching the film and doing some research. The film focuses on four groups. Christian Bale is an M.D. with Aspergers who heads an investment fund in California. Steve Carrell is in charge of a very small group that makes up a fund with loose ties to one of the big banks. Brad Pitt advises a couple of young fund managers who are based in Colorado and Ryan Gosling is the head of a department at one of the big banks who sees what his bosses are blind to. The film jumps back and forth between these groups (although Gosling and Carrell are working together). They are as amazed as the audience at what is going on and shocked that no one else sees it. McKay and co-writer Charles Randolph use humor and celebrity cameos to explain how some of these complicated financial instruments work. And for the most part it helps simplify something not many people would get. It also is pretty entertaining to watch Margot Robbie, Anthony Bourdain and Selena Gomez explain this stuff. Gosling’s character narrates large portions of the film and breaks the fourth wall by talking directly to the audience. It sounds like it could be disjointed, but it mostly works. The performances are all very good, but Carrell shines above all others, The easiest comparison to a film currently in theaters is to place THE BIG SHORT side by side with SPOTLIGHT. Both involve crimes that make you wonder about morality and good versus evil and whether there is any good left. The big difference here is SPOTLIGHT touches the heart, guts and head more effectively. That may be owing to the nature of the crime. Massive greed versus massive evil. 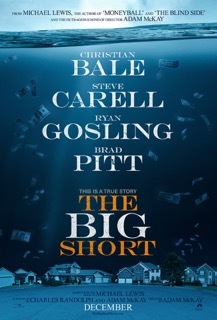 So I didn’t connect as deeply with THE BIG SHORT, but it is a marvelous film that deserves praise for effective use of humor and creative storytelling to get its point across. At its core, else CAROL is a love story. But I got a lot more out of it than two women falling in love. It is also a commentary on how members of the LGBT community were scorned during the early 1950’s. The luminous Cate Blanchett is Carol, a married woman who clearly does not want to be married to her husband (Kyle Chandler). She meets Rooney Mara’s Therese who works as a store clerk. they first notice each other in that “lock eyes across the room” way. Carol pursues and Therese is intrigued and willing prey. She is not happy about much in her life. Not her job, nor her boyfriend. So the two ladies hit it off, have lunch, a few more meetings before they head off on a drive across the United States. Their bond goes stronger as Carol continues to deal with things at home. Her husband wants sole custody of their daughter because of Carol’s “moral turpitude”. She loves women and doesn’t really love him. She is put through the ringer and looked at with scorn by all involved. She is forced to see a psychotherapist to “fix” her. Therese seem at once confused and intrigued. She asks her boyfriend if he’s ever loved a boy, and he dismisses the notion as outrageous. A sign of the times. Todd Haynes direction is perfect, capturing each moment and lingering just long enough to read faces and what is behind the mask. The production design and cinematography by Judy Becker and Edward Lachman are gorgeous. The look of the film is captivating and every shot of Blanchett makes her look alluring, desirable but troubled. Chandler and Cory Michael Smith (Edward Nygma from GOTHAM) are great. Chandler plays against his nice guy type, but his bad behavior is born more out of confusion than evil. Smith is loathsome as a private detective who spies on Carol and Therese. But this is Blanchett and Mara’s movie. They compliment each other rather than trying to chew the scenes away from each other. Blanchett can say more with a look or a smile than pages of dialogue. Mara is mesmerizing. You feel her tortured confusion, her lack of direction while at the same time she is eager to please. The movie does get a bit preachy, but it’s not distracting and given the subject matter it is understandable. One warning for anyone thinking of bringing a child to see this, it is an adult movie. There is a love scene between Blanchett and Mara. It is not exploitive, but it is graphic. I’m sure both Blanchett and Mara will get acting and supporting acting nods. Both are nominated for Golden Globes and SAG Awards. 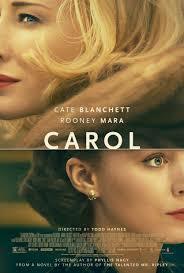 CAROL will touch your mind and your heart. What more can you ask for. Full disclosure, I am a dork. I admit it, so I had no problems going again to see THE FORCE AWAKENS. This time in 3D. The 3D is great, subtle but immersive. I loved it just as much the second time. Daisy Ridley is more of a star than I noticed on first viewing. John Boyega is a very very tiny notch below. I caught a bunch more easter eggs that I missed the first time. There are scenes and shots that sent chills up my spine and planted a smile on my face. It awakened the little kid in me all over again. That is what this kind of film is supposed to do. I cannot wait until May of 2017 for episode VIII!!! 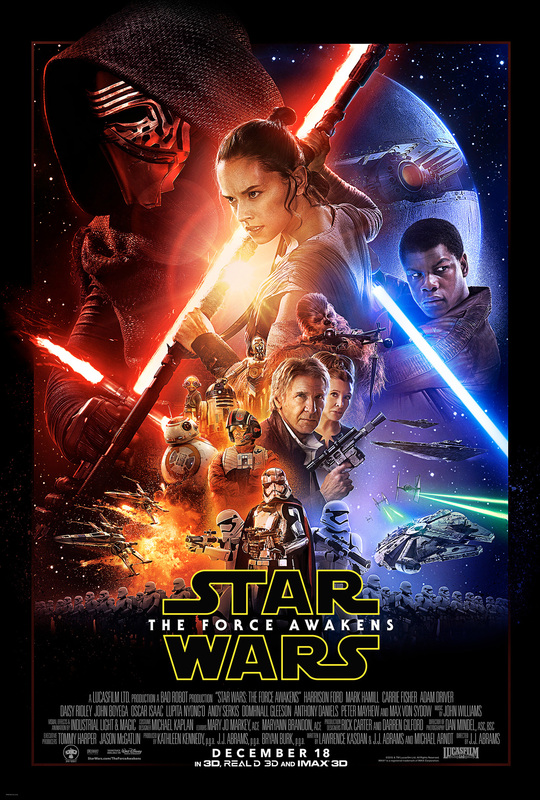 Here is a spoiler free review of STAR WARS: THE FORCE AWAKENS: People live. People die. The Force is good & bad. The Empire isn’t gone. The Resistance are good guys. There are droids & X-Wing fighters battling Tie fighters in space. So if you want zero spoilers, stop right there. Thanks for reading. Like us on Facebook. I began reviewing this comedy last July, in Milan, where I saw half of it in Italian, without subtitles. Having just watched it again, from the beginning, in English, filled in a lot of gaps and also better explained the tepid Italian audience reaction. Because the pop culture references are front-loaded in the movie, I saw most of them the first time, and in addition to the silence that greeted the previously mentioned “Law & Order” theme music and the Jay Leno cameo, here are some other gags they may not have gotten: “toss a salad” as a sexual phrase, the Electric Slide, “Trix are for Kids”, the sitcom “Sister, Sister”, “[smarter] than the average bear”, and Lauren Sanchez (who admittedly would baffle most American audiences). As for the movie itself, while way too long (comedies should almost never exceed two hours), there’s plenty to laugh at; had a full half-hour been cut, it would have left us wanting more. In that sense, TED 2 is like Seth MacFarlane’s A MILLION WAYS TO DIE IN THE WEST, but better in that it doesn’t waste quite as much time on the romance (here, between Mark Wahlberg and Amanda Seyfried). Amanda, by the way, sings a lovely ballad with lyrics by Seth (Walter Murphy did the music), with an even lovelier version by Norah Jones over the end credits. Best inside joke: Patrick Warburton doing cosplay at a Comic-Con convention — as The Tick! Bleak, but not airless, thanks to a “Greek chorus” of Hardy-esque landscapes, suggesting eternal Nature’s obliviousness to the small dramas of domestic life. That’s the beauty of the film —but there’s a problem with the smallness of the drama. The camerawork may find you pulling on a sweater, with its shots of the cold, wet, and sometimes stormy Norfolk countryside. But it also marvelously illuminates character, especially Charlotte Rampling as the wife. Although older now, Rampling is as arresting to look at as ever, all sculptural cheekbones and lithe body. But as her world crumbles in the course of a week, watch her (with the help of DP Lol Crawley) externalize despair, watch as she seems to just give up. The acting — Rampling and her equal, Tom Courtenay — is perfection; you couldn’t ask any more of these performances. So why was I less sympathetic than I think I was supposed to feel by Rampling’s inability to move on? The screenplay has psychological logic on its side: in the movie, the wife learns things she never knew about her husband’s previous girlfriend, including (one of two big reveals) that the girl was the love of his life. And this on the week of their 45th anniversary party. At the end of the movie, Rampling is still in a state of shock, excruciatingly having to appear as though she’s enjoying herself at the party, including a dance with her husband that ends with an angry gesture. She cannot forgive him, though he’s done nothing wrong. I guess that’s the point, the tragedy of the situation. But I’d love to know if a year (or two, or five) later, the couple had managed to reach an accommodation. Remake or reimagining. Either are tricky enterprises. Taking something beloved and making it fresh, or trying to salvage something from the wreckage of failed sequels is a challenge I would not wish on most filmmakers. So, when you are trying to reboot ROCKY how do you do honor the original while making something fresh. Director Ryan Coogler’s CREED is a roadmap on how to do all that successfully. 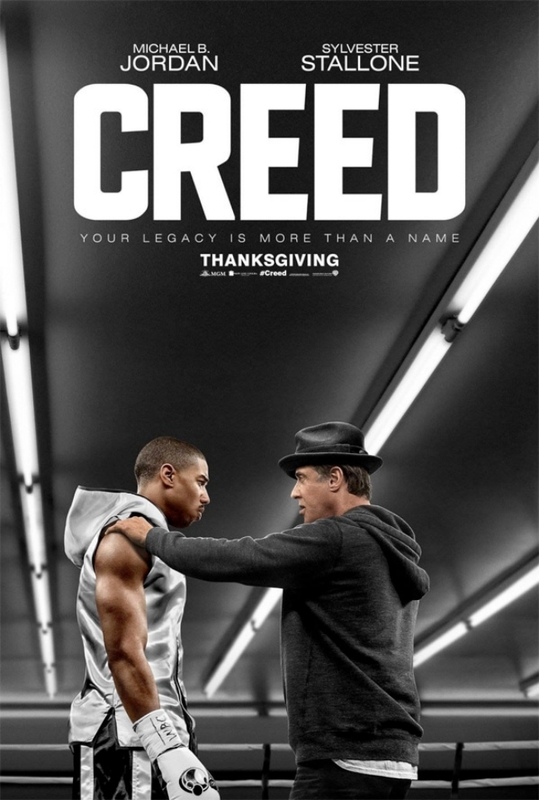 The movie focuses not on Rocky Balboa, but on the illegitimate son of his opponent/best friend Apollo Creed. Michael B. Jordan is Adonis Johnson (he has taken his mother’s maiden name), who bounces from foster home to youth prison because he is constantly fighting. Apollo’s widow shows up and takes him in and gives him the home he never had. Flash forward and “Donny” is still fighting. He is going into Mexico to fight, trying to make a name for himself. Finally, he gives up his education and his good paying job to dive headfirst into the boxing game. To do that he has to move to Philadelphia where he seeks out Rocky. The rest of the film shows Donny trying to learn how to box from the Rock until he is afforded an opportunity to fight the best boxer on the planet much the same way Rocky was first set up with his father. Jordan and Sylvester Stallone have instant chemistry as the student and the teacher. The banter feels natural and familiar. This is the Stallone I love. The wry actor who can play both drama and comedy equally well. This Rocky is almost lovable. Someone you want to root for, just like in the first film. Jordan is such a good actor. He channels Donny’s fury and frustration into a drive to win at all costs. He also plays the tender moments well, whether he is supporting Rocky or wooing his girlfriend played by Tessa Thompson. The thing that made ROCKY so great was you almost (or actually)standing and cheering for him as he battled the superior fighter. This film owns that same territory. Coogler has a deft touch with the material and hits every note perfectly. If there is a film and a hero to root for, it is CREED.